What’s the fact about Bill.com? Let’s start with the fact, that this app is not for you if you are a private individual. It is for small businesses, accountants and, this is different from the rest, for banks. The app is usable as a standalone software to automate your payables and receivables. With bill.com you can create invoices, send them online and track customers payments. As the name says “bill” has one major goal and this is what “Bill.com” is ahead of its competition. Bill.com provides you with a variety of possibilities to pay your bills via ACH (Automated Clearing House), credit card, PayPal and paper checks. ACH stands for Automated Clearing House, it offers something closer to the future than most business software solutions. Before we go ahead, a short excursion about ACH. ACH allows full automated credit transfers. What do I gain with Bill.com account? Once payments have been approved by the designated “boss”, transactions are done by the system before or on the due day. That includes direct deposits, payroll and vendor payments all organized right away through your BILL.COM account. Once set up, it is a powerful tool that takes over all your payments. You will pay your vendors on time and maintain an excellent creditworthiness while reducing the time you usually spend doing it. Furthermore, it helps you out to make it as easy as possible for your customers to pay the invoices you sent to them. With bill.com you can create customer accounts. Your customer can login to this account to review your invoices, hopefully, confirm them and pay the billed amount right away to your bank account. Bill.com allows you to track expenses and approve reimbursements for employees, the payroll feature is integrated too. This works only if the payables are imported to the bill.com tables. Here are the options that are offered; CSV (Comma Separated Values), human data entry (you are typing in information like customers and vendors, prices and taxes, items and services and so on into the system yourself). Of course, there is an option for automatization. You forward your scanned invoices and e-invoices to your designated email address and data will be extracted for you. What is left to do for you? just to approve, to deny, to edit or to cancel. What if you’re integrated with Bill.com? What is the use if you have the best business software without integrating it your books. 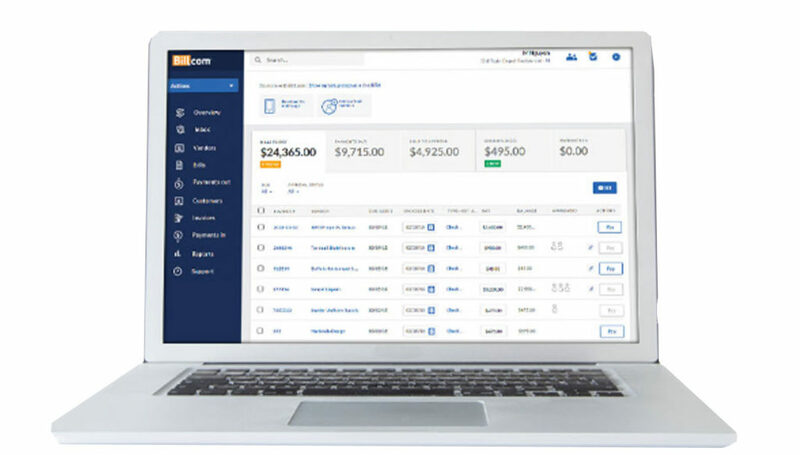 Bill.com integrates with any plan you choose to QuickBooks and Xero. In case you or your accountant are using bookkeeping software like intact, NetSuite. The data is synchronized permanently and automatically to provide the best user experience. One more integration is to mention if you are maintaining a salesforce or field customer service or like to import your receipts via smartphone. Bill com integrates Tallie an impressive expense tracker software. Do you want to know: What does it cost? Compared with the competition it is certainly on the pricey side. Bill.com offer its main service, the automation of payments, for $60 user/month and only from here and above it offers more as a common expense tracker. To the monthly fees, you must pay for all transactions you make using bill.com. Different to similar programs, bill.com takes a fixed amount per transaction. In this plan, you can manage either your payables or your receivables. It gives you standard approval workflows and five standard user roles. This plan adds the integration to QuickBooks and Xero to the Essential plan and allows you to customize user roles. Another strong feature is added to this plan Cash Forecast and Management. Your entered data enables bill.com to predict your payables or receivables in views of seven, 30, and 90 days. Finally, you are allowed to manage payables and receivables and automate them. Furthermore, the Robust Workflow Options are added with custom approval limits and discounted “approver-only” user. You will get an API to access Bill.com and everything becomes Multi.